Central idea and Doctrine: The Ascension. Practical application: Children of the Father. To view the Lectionary 58 readings, click here. As much as they might like to, the Apostles are not going to know the future, except that soon the Holy Spirit will come upon them and someday Christ will return. We don’t know the future either. The Apostles will be given power by the Holy Spirit to work in the present time, to understand God’s message and to witness it. We have this same power. They are to spread the Gospel from the center, Jerusalem, out to what was left of the Jewish kingdom (Judea), out to the lands which were once Jewish (Samaria), and out to the entire world. We are to continue this work. How do human beings express joy? Communally, we do it with glad shouts and cries, songs, and music, the louder the better. What is this occasion of joy? Christ has ascended into heaven where he sits at the right hand of God the Father. God is ultimately the king of this world, but he has left it in our hands, who are good, indifferent, and bad stewards. We will sing this praise anew when we enter the Kingdom of God in heaven where Christ reigns. We will doubly sing this praise in the New Creation when Christ reigns as its visible king. Paul wants the Christians at Ephesians to know and experience what they can hope for, based on the exalted status of the Church, based on the exalted status of Christ, based on the power and authority of God. God possesses the fullness of being, goodness, truth, beauty, and power. God in Christ has revealed that within the one God are three persons, alluded to here: The Father of glory, the LORD Jesus Christ, and the Spirit. In raising him from the dead, God has given the Son supreme power and glory. Thus, our inheritance is God himself, which means to share in the life of God. “I am with you always” is why and how Christ’s disciples carry the Commission out. One who commissions another can only do so based on the legitimate authority he possesses. Those who are commissioned can only do the work they are commissioned to do. They are to announce the Gospel to all. They are to baptize into the Trinity anyone who accepts the Gospel. They are to teach the baptized the way of love Christ has taught the Apostles. In the Creed we proclaim that Our Lord “ascended into heaven and is seated at the right hand of the Father.” What does it mean to “ascend into heaven” and to be “seated at the right hand of the Father”? Christ is a kind of road from earth to heaven. 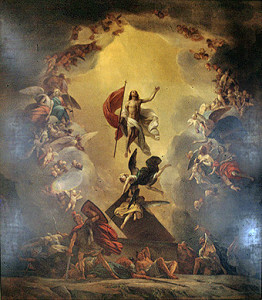 Christ’s Ascension or going up to heaven completes his Incarnation or coming down to earth. Christ has opened the way to heaven for us. (CCC 661). “Jesus Christ, the head of the Church, precedes us into the Father’s glorious kingdom so that we, the members of his Body, may live in the hope of one day being with him for ever” (CCC 666). Christ the King is the destination of this journey. Being seated at the right hand of the Father means Christ has “the glory and honor of divinity” (CCC 663). It is right to love, honor, respect, and obey many persons, especially beginning with our own parents. However, the Church uses the term latria to refer to the supreme loving worship or adoration which belongs only to God. While there are many reasons and ways to adore God, Christians adore God the Father as his children. This insight should allow us to pray the Lord’s Prayer in a new way. We can say “Our Father” because we are really his sons and daughters. Every time we have the occasion to consider God as Father, we can realize that through the ascended Christ, we are reborn and adopted into, conformed to, and sharers in God’s own divine life.